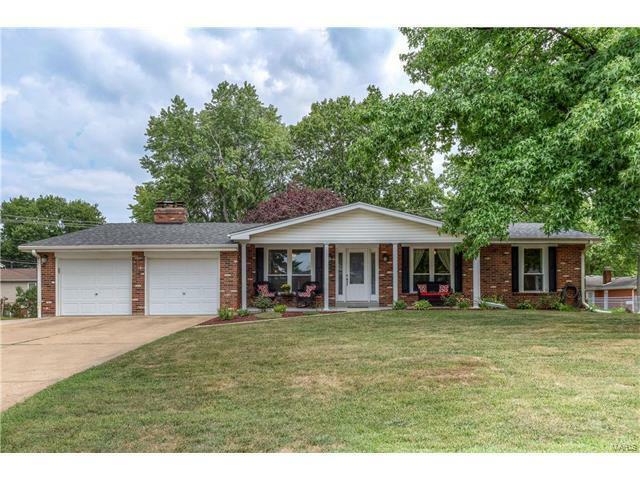 Adorable 3 bedroom, 3 full bath ranch with extensive remodeling over the past 4 years! Exterior updates include NEW thermal windows throughout house '16, NEW Arch roof '13, NEW Front door '14, NEW front porch concrete and columns '13, NEW 3rd car parking pad '14. Floorplan is open and the décor is charming with refinished hardwood flooring, new lighting, neutral painting throughout, 2 fireplaces. UPDATED hall and master baths with new vanities, toilets. NEW 2 panel doors, base molding and lighting fixtures throughout. Kitchen has white cabinetry, NEWER ceramic flooring, SS appliances, backsplash, countertop, sink, faucet and walks out through NEWER sliding doors to patio and fenced, flat yard. Kitchen opens to family room with NEWER carpet and gas fireplace. UPDATED basement has HUGE REC ROOM with NEW wood grain ceramic tile flooring, wdb fireplace, dry bar with cabinets, private sleeping space and beautifully finished 3rd bath.